What happens whenMagerealmdabbles in a little science fiction? Things get cyberized! 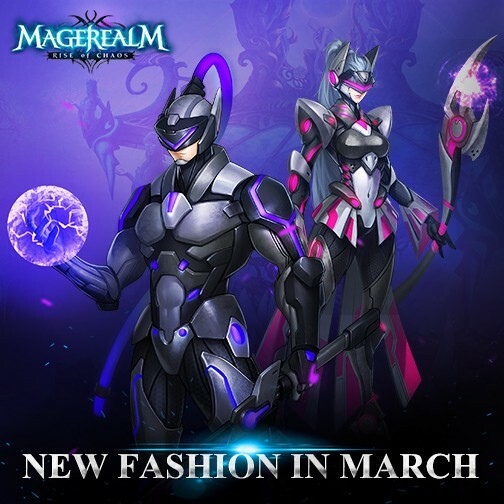 Magerealm is bringing some futuristic new content for players this March, including brand new fashion, wings and mount! Put away your robes and wands for a sleek Cyborg Soldier suit! Join the elite Cyborg Battalion and repel the invading alien insectoids (just kidding). Suit up for the future and look out-of-this-world with the new Cyborg Soldier fashion! In the year 3099, when organic matter like feathers are but a faint memory, a new prototype Wing has been engineered using blades of pure plasma. Powered by an internal nuclear reactor, just one of these prototypes can generate enough power to destroy a moon or two. Watch where you point those things! Everyone knows the Zero Cycle is the quickest and most stylish way to speed around the sector! Hop on and blaze a trail of light on this marvel of advanced engineering. But be careful around those corners or you’ll be eating virtual pavement. Get pumped this March because Magerealm is giving players a glimpse of something they’ve never seen before in the Realm! Follow Magerealm on Facebook and visit the official site and forums to get the latest news and participate in rewarding events!